Decreased cardiac output adversely affects the cardiac rate, rhythm, preload, afterload and contractibility, all of which can have serious complications and side effects. The signs and symptoms of decreased cardiac output include the abnormal presence of S3 and S4 heart sounds, hypotension, bradycardia, tachycardia, weak and diminished peripheral pulses, hypoxia, cardiac dysrhythmias, palpitations, decreased central venous pressure, decreased pulmonary artery pressure, dyspnea, fatigue, oliguria and possible anuria, decreased organ and tissue perfusion, and adventitious breath sounds like crackles, and orthopnea. Of all the cardiac rhythms, only the normal sinus rhythm is considered normal. All other rhythm strips are abnormal and some of these abnormal rhythms are relatively harmless and often immediately correctable and others can be life threatening when they are not treated promptly and effectively. Normal sinus rhythms have a rate of 60 to 100 beats per minute, the atrial and the ventricular rhythms are regular, the P wave occurs prior to each and every QRS complex, the P waves are uniform in shape, the length of the PR interval is form 0.12 to 0.20 seconds, the QRS complexes are uniform and the length of these QRS complexes are from 0.06 to 0.12 seconds. As previously stated, the normal sinus rhythm is the only normal cardiac rhythm in terms of the cardiac rate, cardiac rhythm, its P waves, its PR intervals AND its QRS complexes. Sinus tachycardia is a sinus rhythm that is like the normal sinus rhythm with the exception of the number of beats per minute. Sinus tachycardia is characterized with a cardiac rate of more than 100 beats per minute, the atrial and the ventricular rhythms are regular, the P wave occurs prior to each and every QRS complex, the P waves are uniform in shape, the length of the PR interval is from 0.12 to 0.20 seconds, the QRS complexes are uniform and the length of these QRS complexes are from 0.06 to 0.12 seconds. This abnormal sinus rhythm can occur secondary to hyperthyroidism, some medications, hypertension, hyperpyrexia, extreme stress and anxiety, the presence of pain, some electrolyte imbalances, preexisting heart disease and the intake of illicit substances like cocaine and the excessive intake of nicotine, alcohol and caffeine. Some of the treatments for sinus tachycardia include the treatment of an underlying disorder or a problematic medication and no treatments when the client is asymptomatic. When the client is, however, symptomatic, the client can be treated symptomatically with supplemental oxygen because this rhythm increases the heart's muscle need for increased oxygenation. Some of the complications associated with sinus tachycardia include a decrease in terms of the client's cardiac output and a myocardial infarction. Sinus bradycardia is a sinus rhythm that is like the normal sinus rhythm with the exception of the number of beats per minute. Sinus bradycardia has a cardiac rate less than 60 beats per minute, the atrial and the ventricular rhythms are regular, the P wave occurs prior to each and every QRS complex, the P waves are uniform in shape, the length of the PR interval is form 0.12 to 0.20 seconds, the QRS complexes are uniform and the length of these QRS complexes are from 0.06 to 0.12 seconds. 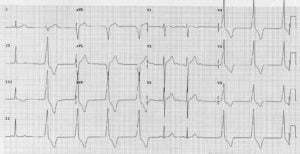 This abnormal sinus rhythm can occur secondary to hypothyroidism, some medications like a beta blocker or digitalis, increased intracranial pressure, hypoglycemia, hypothermia, preexisting heart disease and an inferior wall myocardial infarction which involves the right coronary artery. Some of the treatments for sinus bradycardia include the treatment of an underlying disorder or a problematic medication and no treatments when the client is asymptomatic. When the client is, however, symptomatic, the client can be treated with atropine and cardiac pacing when the client is compromised and at risk for reduced cardiac output. Atrial arrhythmias occur when the heart's natural pacemaker, the sinoatrial node does not generate the necessary impulses that are required for the normalfunctioning of the heart. When this occurs, intermodal pathways and atrial tissue initiate the impulse necessary for the heart to beat and pump. The four types of atrial arrhythmias include atrial flutter, atrial fibrillation, supraventricular tachycardia and premature atrial contractions or complexes (PAC). Atrial flutter, which is a relatively frequently occurring tachyarrhymia, is characterized with a rapid atrial rate of 250 to 400 beats per minute, a variable ventricular rate, a regular atrial rhythm, a possibly irregular ventricular rhythm. The P waves are not normal, the flutter wave has a saw tooth looking appearance, the PR interval is not measurable, QRS complexes are uniform and the length of these QRS complexes are from 0.06 to 0.12 seconds. Atrial flutter is associated with the aging process, chronic obstructive pulmonary disease, a mitral valve defect, cardiomyopathy, ischemia; and the possible signs and symptoms of atrial flutter include weakness, shortness of breath, chest palpitations, angina pain, syncope and anxiety. The risks and complications of atrial flutter include atrial clot formation, a pulmonary embolus, a cerebrovascular accident, and a drop in cardiac output. Atrial flutter can be treated with anticoagulant therapy to prevent clot formation, cardioversion, and medications like the antiarrhymic medications of procainamide to correct the flutter and a beta blocker or digitalis to slow down the rate of the ventricles. Atrial fibrillation is characterized with an rapid atrial rate of 350-400 beats per minute, a variable ventricular rate, an irregular rhythm, the P waves are nonexistent and they are replaced with f waves, the PR interval is not present, the QRS complexes are uniform and they look alike, and the length of these QRS complexes are from 0.06 to 0.12 seconds. Some of the diseases and disorders associated with this cardiac arrhythmia include hypertension, heart failure, impaired sinus node functioning, hypoxia, a mitral valve defect, pericarditis, rheumatic heart disease, coronary artery disease, hyperthyroidism, the aging process and the presence of a pulmonary embolus. Some of the signs and symptoms of atrial fibrillation include chest tightness, palpitations, shortness of breath, dyspnea, fluttering in the chest, dizziness, confusion, fainting, and fatigue. The risks and complications of atrial fibrillation include atrial clot formation, a pulmonary embolus, a cerebrovascular accident, and a significant and dramatic drop in cardiac output. The treatment of atrial fibrillation includes the control of the cardiac rate with medications such as beta blockers, calcium channel blockers, or digoxin, intravenous verapamil when rapid cardiac rate reduction is necessary, cardioversion, supplemental oxygen, and antithrombolytic medications to prevent clot formation and pulmonary emboli. 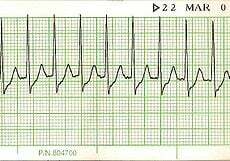 Premature atrial contractions occur when the p wave occurs prematurely. After this premature p wave, there is a compensatory pause. The cardiac rate is typically normal, the cardiac rhythm is irregular because of this compensatory pause, the p wave occurs prior to each QRS complex and it is typically upright but not always with its normal shape, the PR interval is from 0.12 to0.20 seconds, the QRS complexes look alike, and the length of the QRS complexes ranges from 0.06 to 0.12 seconds. Premature atrial contractions, which result from the atrial cells taking over the SA impulses, is associated with a number of different diseases and disorders such as hypertension, ischemia, hypoxia, some electrolyte disorders, digitalis use, stress, fatigue, the use of stimulants such as caffeine and nicotine products, some valve abnormalities, some infectious diseases, and also among clients without any cardiac disease or other disorder. The signs and symptoms of premature atrial contractions include palpitations and client reports that they feel a "missed beat" which results from the compensatory pause. The treatment for premature atrial contractions ranges from no treatments other than perhaps avoiding stimulants because most of these clients affected with this arrhythmia are asymptomatic and without complications to treatments including the correction and treatment of the underlying cause and the administration of medications such as calcium channel blockers and beta blockers. Supraventricular tachycardia, simply defined is all tachyarrhythmias with a heart rate of more than 150 beats per minute. The atrial and ventricular cardiac rates are from 150 to 250 beats per minute, the cardiac rhythm is regular, the p wave may not be visible because it is behind the QRS complex, the PR interval is not discernable, the QRS complexes look alike, and the length of the QRS complexes ranges from 0.06 to 0.12 seconds. The risk factors associated with supraventricular tachycardia include atherosclerosis, hypokalemia, hypoxia, stress, and stimulants; and some of the signs and symptoms include polyuria, palpitations, syncope, dizziness, chest tightness, diaphoresis, fatigue, and shortness of breath. The treatments for supraventricular tachycardia include the performance of the vagal maneuvers such as the Valsalva maneuver and coughing, as well as oxygen supplementation when the client is asymptomatic; and medications such as adenosine and cardioversion when the client is symptomatic. A complication of this cardiac arrhythmia is heart failure. Ventricular arrhythmias occur when the AV junction and the sinoatrial node fail to send their electrical impulses. As a result of this failure, the ventricles take over the role of the heart's pacemaker. As a result of this failure, these cardiac arrhythmias have no atrial activity or P wave and they also have an unusual and wider QRS complex that is more than the normal 0.12 seconds. An idioventricular rhythm is characterized with a ventricular rate of 20 to 40 beats per minute, a regular rhythm, the absence of a P wave, a PR interval that cannot be measured, a deflection of the T wave, and a wide QRS complex that is greater than 0.12 seconds. Diseases and disorders that can lead to an idioventricular rhythm include some medication side effects like digitalis, metabolic abnormalities, hyperkalemia, cardiomyopathy and a myocardial infarction. 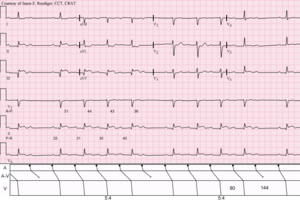 The client with an idioventricular rhythm may present with mottled, cool and pale skin, dizziness, hypotension, weakness, and changes in terms of the client's mental status and level of consciousness. The treatments for an idioventricular rhythm include a cardiac pacemaker, the administration of atropine, the administration of dopamine when the client is adversely affected with hypotension, and cardiopulmonary resuscitation when this cardiac arrhythmia leads to cardiac stand still and asystole. 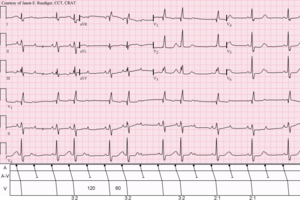 An accelerated idioventricular arrhythmia occurs when both the SA node and the AV node have failed to function. The cardiac rate runs from 40 to 100 beats per minute, the rhythm is usually regular, the P wave is absent, the PR interval is not able to be measured, the QRS complexes are wide and more than 0.12 seconds in duration, the T wave is detected and the cardiac output is decreased. mottled, cool and pale skin, dizziness, hypotension, weakness, and changes in terms of the client's mental status and level of consciousness. This arrhythmia is a serious one that, when left untreated, can lead to cardiac arrest and standstill, therefore, immediate treatments with a cardiac pacemaker, the administration of atropine, the administration of dopamine when the client is adversely affected with hypotension, and cardiopulmonary resuscitation may be indicated. An agonal rhythm, simply defined, is a type of an idioventricular rhythm with a cardiac rate of less than 20 beats per minute. Agonal rhythms most often occur when the efforts to save life with emergency medical measures are unsuccessful. The rate is slow and less than 20 beats per minute, the rhythm is typically regular, the P wave is absent, the PR interval is not measurable, and the QRS interval is abnormally wide and more than 0.12 seconds with an abnormal T wave deflection. Agonal rhythms can be caused by a myocardial infarction, trauma and predictable changes at the end of life and it is signaled with the lack of a palpable pulse, the lack of a measurable blood pressure and the complete loss of consciousness. The treatment of this serious and highly life threatening dysrhythmia includes the initiation of CPR and the advanced cardiac life support (ACLS) protocols, if the client has chosen these life saving treatments. Ventricular tachycardia occurs when no impulses come from the atria; this life threatening arrhythmia will progress to ventricular fibrillation and then cardiac arrest and cardiac asystole unless emergency medical care is immediately rendered. The cardiac rate can range from 101 to 250 beats per minute, the ventricular rhythm is regular but the atrial rhythm cannot be distinguished, there are no P waves, the PR interval is not measurable, and the QRS complex is greater than 0.12 seconds. The risk factors associated with ventricular tachycardia include severe cardiac disease, myocardial ischemia, a myocardial infarction, digitalis toxicity, some electrolyte imbalances, heart failure and some medications. Some of the signs and symptoms include hemodynamic compromise, unconsciousness, angina chest pain, palpitations, shortness of breath, dizziness, syncope, hypotension, and the absence of a pulse or a rapid pulse rate. Additionally, the client may not have any signs or symptoms when there are less than 30 seconds of ventricular tachycardia. The complications can include ventricular fibrillation which can lead to cardiac arrest. Immediate CPR and ACLS protocols, cardioversion, the placement of an internal pacemaker, amiodarone, lidocaine and antiarrhythmic medications may be used for the treatment of ventricular fibrillation according to the client's condition and their choices. The two types of ventricular fibrillation that can be seen on an ECG strip are fine ventricular fibrillation and coarse ventricular fibrillation; ventricular fibrillation occurs when there are multiple electrical impulses from several ventricular sites. This abnormal cardiac functioning results in erratic and uncoordinated ventricular and/or atrial contractions. The rate of contraction cannot be determined, the rhythm is not detectable because it is highly erratic and disorganized, there are no P waves, no PR interval and no QRS complexes. Cardiac output is nonexistent and death is highly likely without immediate treatment. The risk factors associated with ventricular fibrillation include non treated ventricular tachycardia, illicit drug overdoses, a myocardial infarction, severe trauma, some electrolyte imbalances, and severe hypothermia. The client loses consciousness and there is an absent pulse during ventricular fibrillation; emergency measures include CPR, ACLS protocols including defibrillation, and other life saving measures are indicated for the client with this highly serious life threatening cardiac arrythmia. Asystole is a flat line. There is no cardiac rate, no rhythm, no P waves, no PR interval and no QRS complex. Asystole occurs most frequently when ventricular fibrillation is not corrected, but it can also occur suddenly as the result of a myocardial infarction, an artificial pacemaker failure, a pulmonary embolus and cardiac tamponade. Immediate BLS and advanced life support is necessary. Intravenous adrenaline, sodium bicarbonate and atropine, as well as 100% oxygen are done in hopes of saving the person's life. The classical features of torsades de pointes are a long QT interval in addition to a downward and upward deflection of the QRS complexes that are seen on the cardiac strip. The cardiac rate can range from 150 to 250 beats per minute, the rhythm can be irregular or regular, the PR interval is not measurable, and the QRS complex is widened with upward and downward deflections. Torsades de pointes can occur as the result of an over dosage of a tricyclic antidepressant drug of phenothiazine, hypomagnesemia and hypokalemia. It can be short lived and self-limiting without any treatment but it can also lead to ventricular fibrillation when it is not corrected and treated. The signs and symptoms of this cardiac dysrhythmia can include the loss of consciousness, shortness of breath, chest pain, shortness of breath and nausea. The treatment of torsades de pointes, which can be life threatening, includes the initiation of CPR and ACLS protocols, the bolus administration of magnesium sulfate, cardioversion, and the correction of any underlying and causal factor or condition. First degree atrioventricular heart block occurs when the AV node impulse is delayed, thus leading to a prolonged PR interval. The P wave is present before each QRS complex, the PR interval is more than 0.20 seconds. The most common causes of first degree heart block are an AV node deficit, a myocardial infarction particularly an inferior wall myocardial infarction, myocarditis, some electrolyte disorders, and medications like beta blockers, cardiac glycoside medications, calcium channel blockers and cholinesterase inhibitors. Most episodes of transient first degree heart block are benign and asymptomatic, but at times, it can lead to atrial fibrillation and other cardiac irregularities of varying severity according to the length of the PR interval prolongation. The treatment of first degree heart block includes the correction of the underlying disorder, the elimination of problematic medications, and routine follow up and care. Second degree atrioventricular block Type I, which is also referred to as Wenckebach and Mobitz type I, has progressively longer impulse delays through the AV node. This increasing prolongation leads to the progressive lengthening of the PR interval until is leads to a non conducted P wave and the absence of a QRS complex. A second degree atrioventricular block Type I that has four P waves and three QRS complexes is referred to as a 4:3 Mobitz Type I block and a second degree atrioventricular block Type I that has three P waves and two QRS complexes is referred to as a 3:2 Mobitz Type I block. A similar ratio designation is used for second degree atrioventricular block Type II, as you will learn in the next section. Most clients affected with Wenckebach or Type I Mobitz heart block are asymptomatic but others may experience syncope, dizziness, fainting and feeling somewhat light headed. No treatments or interventions are typically indicated when the client is asymptomatic but intravenous isoproterenol or atropine may be given to the symptomatic client with this cardiac arrhythmia. Second degree AV block type II, also known as Mobitz type II, occurs when the AV node impulses are intermittently blocked and do not reach the heart's ventricles. This cardiac arrhythmia most frequently occurs as the result of afailure of the His Purkinje conduction system of the heart. Second degree AV block type II is identified with the blocking of the P waves without any subsequent PR shortening and without any preceding PR interval lengthening or prolongation. A 2:1 second degree AV block type II has two P waves for every QRS complex and a 3:1 second degree AV block type II has three P waves for every QRS complex. Treatments for this heart block can include intravenous atropine, supplemental oxygen, and, in some cases, a temporary or permanent pacemaker, as indicated. Third degree atrioventricular block (AV block), also known as complete heart block, is a cardiac arrhythmia that occurs when the SA node impulses are completely blocked by the ventricles of the heart which leads to the lack of synchrony, coordination and a relationship between the atria and the ventricles. This lack of relationship is sometimes referred to as AV disassociation. The cardiac rates for the atria and the ventricles are different and the QRS complexes are wide and prolonged. The first rhythm consists of the P wave to P wave interval; and the second rhythm is the R to R interval as seen in the QRS complex. Some of the conditions and disorders that can lead to complete heart blood include rheumatic fever, coronary ischemia, an inferior wall myocardial infarction, the presence of an atrial septal defect, and some medications including digoxin and beta blockers, for example. The signs and symptoms of this cardiac arrhythmia can include syncope, dizziness, fainting, chest pain and a loss of consciousness. Third-degree AV block is treated with a pacemaker, medications to control atrial fibrillation and the client's blood pressure, as well as the treatment of any identifiable causes including life style choices and other modifiable risk factors. A bundle branch block occurs when there is a conduction defect from the Purkinje fibers which coordinate the cardiac myocytes so that the ventricles depolarize in the normal and coordinated manner. This defect occurs as the result of a myocardial infarction, heart disease, and at times, as a complication of cardiac surgery. Bundle branch block has wide QRS complexes and the delayed depolarization travels to either the right ventricle in an anterior manner or the left ventricle in a lateral manner, which are referred to as right bundle branch block and left bundle branch block, respectively. Clients affected with bundle branch block may be symptomatic and asymptomatic. A times a permanent pacemaker implantation is necessary for the correction of this cardiac arrhythmia. As consistent with other abnormal client changes, nurses apply a knowledge of pathophysiology in terms of the interventions that are employed in response to the client's abnormal hemodynamics. Some of the knowledge of pathophysiology that is essential to this nursing responsibility includes both cognitive and psychomotor knowledge. The definition of hemodynamics as the flow of blood as ejected from the heart to circulate throughout the body in order to effectively oxygenate the tissues of the body. The resistance to blood flow as a function of the blood's thickness or viscosity, the width of the vessel that the blood is flowing through and the length of the vessel that the blood is flowing through, as mathematically calculated with the Hagen Poiseuille equation. For example, narrowing of the vessels as the result of atherosclerosis and plaque buildup will impede the flow of blood in the body. The normal parameters for hemodynamic monitoring values, as shown below. Decreased cardiac output can lead to a number of physical, psychological and life style alterations, signs and symptoms. Life style alterations may interfere with the client's activity level because the client with decreased cardiac output has a decrease in terms of their tolerance to exercise, fatigue, and weakness. They may also be at risk for accidents such as falls when the client with decreased cardiac output is affected with weakness, fatigue, confusion and other changes in terms of their level of consciousness and mental status. Based on these signs and symptoms of decreased cardiac output, some of the interventions and strategies for clients with decreased cardiac output include can include rest interspersed with light exercise, frequent rest periods, pain management, supplemental oxygen as indicated by the client's doctor's orders, mild analgesia if chest pain occurs, the maintenance of a restful sleep environment and when to call the doctor as new signs and symptoms arise. In addition to the management of cardiac arrhythmias, as previously discussed in the section above that was entitled " Identifying Cardiac Rhythm Strip Abnormalities" including the signs, symptoms, ECG rhythm strips, medical and nursing interventions and emergency care using CPR and ACLS protocols, nurses also monitor and maintain cardiac pacemakers. Temporary and permanent pacemakers are indicated for clients affected with a number of different cardiac conditions and arrhythmias. At times these pacemakers are placed and implanted at the bedside and at other times they are placed in a special care area like a cardiac invasive laboratory or the operative suite. When the registered nurse is assisting with the placement of these pacemakers, the nurse must be knowledgeable about the placement procedure, asepsis, and the care and monitoring of the client undergoing this invasive procedure. After the implantation of a pacemaker, the nurse must be fully aware of the possible complications associated with pacemakers which include bleeding, inadvertent punctures of major vessels, infection, and mechanical failures, including battery failures, of the pacemaker. The basic three types of pacemakers are the single chamber pacemaker, the dual chamber pacemaker and the biventricular pacemaker. Arterial lines, which can be surgically placed in a number of arteries including the femoral, brachial, radial, ulnar, axillary, posterior tibial, and dorsalis pedis arteries, are used for the continuous monitoring of the client's blood pressure and other hemodynamic measurements in addition to drawing frequent blood samples, such as drawing frequent arterial blood gases which could lead to repeated trauma, hematomas and scar tissue formation. Some of contraindications for the use of an arterial line include severe burns near the desired site, impaired circulation to the site, pulselessness, Buerger's disease, and Raynaud syndrome; and arterial lines are cautiously implanted and used when the client is affected with atherosclerosis, a clotting disorder, impaired circulation, scar tissue near the desired site, and the presence of a synthetic graft. Nurse caring for clients with an arterial line must not only monitor the client in terms of their hemodynamic monitoring but also in terms of the possible complications that can arise as the result of arterial lines which can include the inadvertent and accidental puncture of a vessel during placement, catheter breakage and migration, arterial hemorrhage and infection. Clients on telemetry, which is continuous monitoring and recording of the client's ECG strips, can be done by a telemetry technician who is an unlicensed staff member who is specially educated and trained to read and record telemetry and also to alert the nurse when an alarm occurs and/or when an abnormal rhythm is noticed on the telemetry monitor. Telemetry monitoring is also done by nurses. Regardless of who is monitoring the telemetry, it is the nurse caring for the client on the telemetry that is responsible and accountable for the accurate interpretation of the rhythm and the initiation of any and all interventions when interventions are indicated. For example, a telemetry technician may hear an alarm that alerts them to the fact that the client may be having an arrhythmia. This telemetry technician will immediately run and print out the rhythm strip and notify the nurse of this occurrence. The nurse will then apply their knowledge of pathophysiology, their critical thinking skills and their professional judgment skills in terms of their interpretation of the rhythm strip, they will perform a simple system specific assessment of the client, and then they will initiate and document the appropriate interventions based on their assessment of the client and their interpretation of the abnormal rhythm strip. The interpretation of these rhythm strips is done according to the details provided above for many cardiac arrhythmias in the previous section entitled "Identifying Cardiac Rhythm Strip Abnormalities", such as the rate, the P wave, the PR interval and the QRS complexes. The purpose, the procedure and the management of care for the client before, during and after hemodialysis and peritoneal dialysis were previously fully discussed and described in the section entitled "Performing and Managing the Care of the Client Receiving Dialysis". The management of the care for a client with an alteration in hemodynamics such as decreased cardiac output in terms of the assessment for and recognition of the signs and symptoms and interventions was previously discussed above under the section entitled "Providing the Client with Strategies to Manage Decreased Cardiac Output". The North American Nursing Diagnosis Association (NANDA) defines altered and ineffective tissue perfusion as "a decrease in oxygen resulting in a failure to nourish tissues at the capillary level." Ineffective tissue perfusion can occur and adversely affect the brain, the renal system, the heart and the heart muscle, the gastrointestinal tract and the peripheral vascular system. As more fully detailed and discussed previously in the section entitled "Identifying the Client with Increased Risk for Insufficient Vascular Perfusion", some of the risk factors associated with impaired tissue perfusion are hypovolemia, hypoxia, hypotension and impaired circulatory oxygen transport, among other causes. As discussed in the previous section entitled "Evaluating Invasive Monitoring Data", intracranial pressure has an impact on the perfusion of the brain. The normal cerebral perfusion pressure, under normal circumstances, should range from 60 to 100 mm Hg. Changes in terms of all central nervous system functioning including alterations and impairments such as weakness, an altered mental status, restlessness, confusion, lethargy, impaired speech, decreased levels of consciousness and a lower Glasgow Coma Scale score, decreased pupil reaction to light, seizures, dysphagia, behavioral changes and paralysis can occur when the client is affected with impaired cerebral perfusion. The renal system also depends on perfusion and a good flow to maintain its functioning. When the client has impaired perfusion of the renal system, the client may be impacted with Increased blood urea nitrogen, oliguria, anuria, changes in the blood pressure, elevated BUN/Creatinine ratio, and hematuria. Poor tissue perfusion to the heart and the cardiac system can present with signs and symptoms such as angina, abnormal arterial blood gases, hypotension, tachycardia, tachypnea, and a feeling of impending doom. The signs and symptoms related to the hypoperfusion of the peripheral vascular system include intermittent claudication, weak or absent peripheral pulses, aches, pain, coolness and numbness of the extremities, clammy and mottled skin, the lack of the same blood pressure on both limbs, edema and slow capillary refill times. Hemostasis can be categorized as cerebral, cardiac and peripheral hemostasis and it occurs as the result of vascular constriction and spasm, the clotting of blood and the formation of a platelet plug, all of which impede the free flow of blood throughout the body. For example, venous stasis or hemostasis is a commonly occurring complication of immobility and during the post-operative period of time. Hemostasis can occur as the result of the HELLP syndrome during the prenatal period of time, with congenital clotting disorders, with increased blood viscosity, and with impaired platelets; and hemostasis is also the desired outcome of good wound healing when a scab forms and when surgical procedures need hemostasis to prevent a hemorrhage. Hemostasis can lead to poor tissue perfusion and the formation of emboli. The goals of treatment in terms of the management of care for a client with an alteration in terms of their hemodynamics, tissue perfusion and hemostasis include the correction and treatment of any treatable underlying causes, and the promotion of improved tissue perfusion.